Jobsoid allows you to send, receive and view emails in one centralized location, i.e., on the candidate profile itself. You no longer have to switch between your Jobsoid account and your email account to communicate with your candidates. 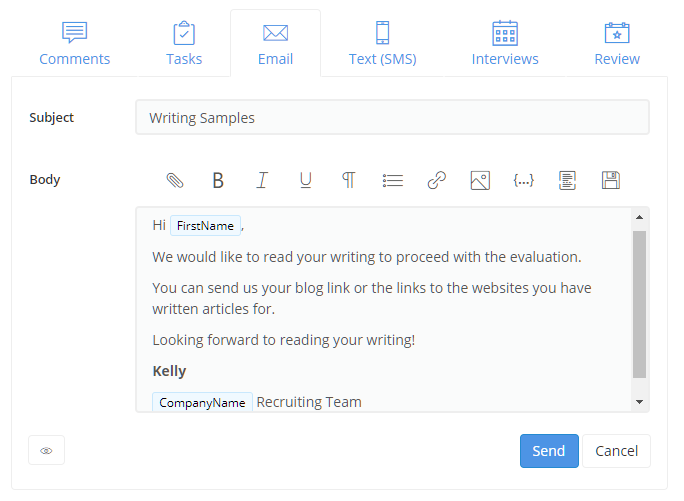 Draft your emails with the help of rich text editor of Jobsoid. Format the text using various formatting style options. Insert images and external links. Attach multiple files in just one click. You can view every email that you send to your candidates and the ones you receive from your candidates in the Recent Activity section on the Candidate profile.